It’s been such an exciting day! I wanted my chakra series to match up with my box, but the postal service miscalculated the journey from New York to Texas. All my fun mail ended up arriving today, so I’ve been taking all kinds of pictures. 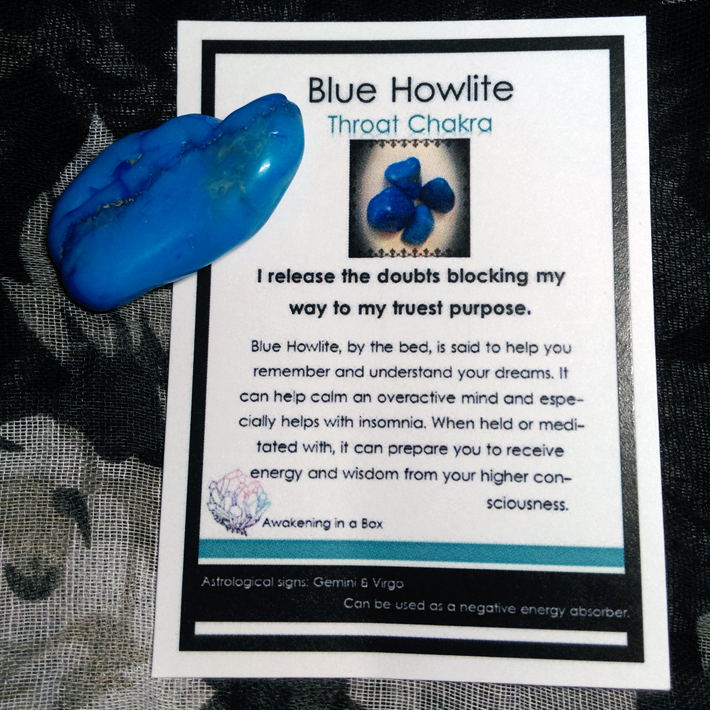 This month’s Awakening in a Box theme is Throat Chakra. It’s my second box since I began my subscription with the Heart Chakra box as a birthday present. Since I shared that box on facebook and Instagram, this month’s box contained an extra stone. You can find out more details about how the box works on my subscriptions page. 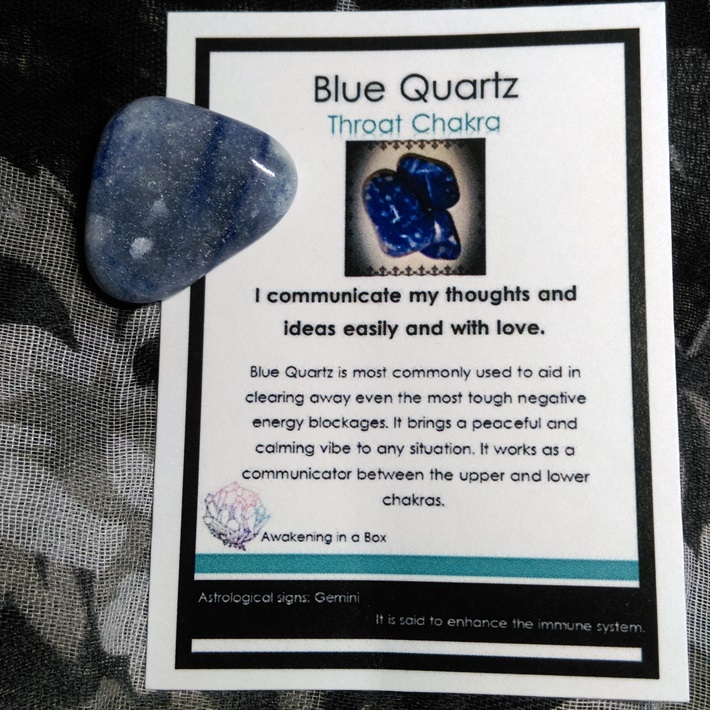 Throat Chakra stones range from true blue to aqua. 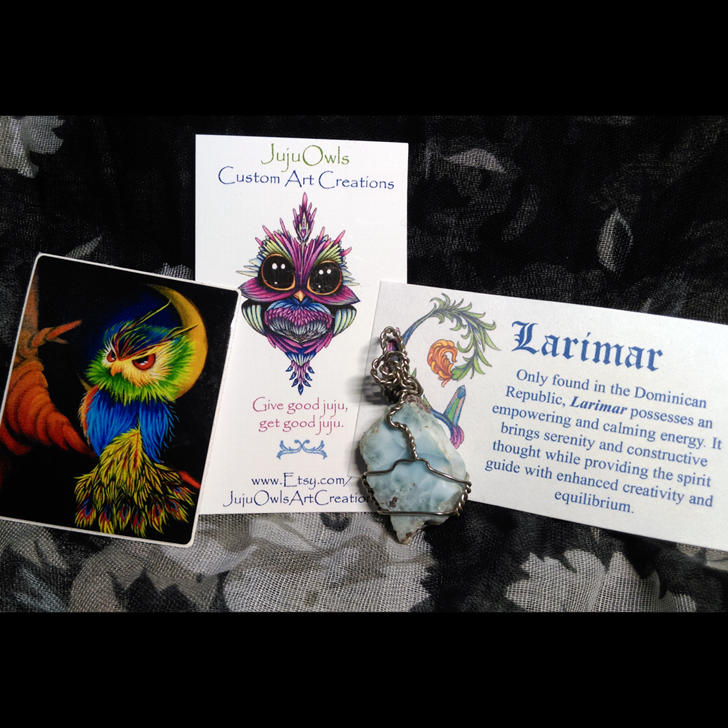 My set includes very large pieces of Sodalite, Blue Howlite and Blue Quartz, each with an ID card. The darkest of the stones, you can typically find sodalite in bins of tumbled stones, but this is the first time I’ve had a rough piece. Howlite is underestimated. It’s often dyed to create an alternative to turquoise. Howlite is naturally white with grey veins, but it absorbs and retains dyes readily, making it extremely versatile like agate. This piece has taken on an amazing hue. Aventurine is a type of quartz stone known for its glittery flecks. You can find the green variety fairly easily, but it’s a little harder to find a blue piece. This one is a beautiful blue-grey. My extra for September is this rough piece of citrine. All the stones are cleansed and charged in moonlight. 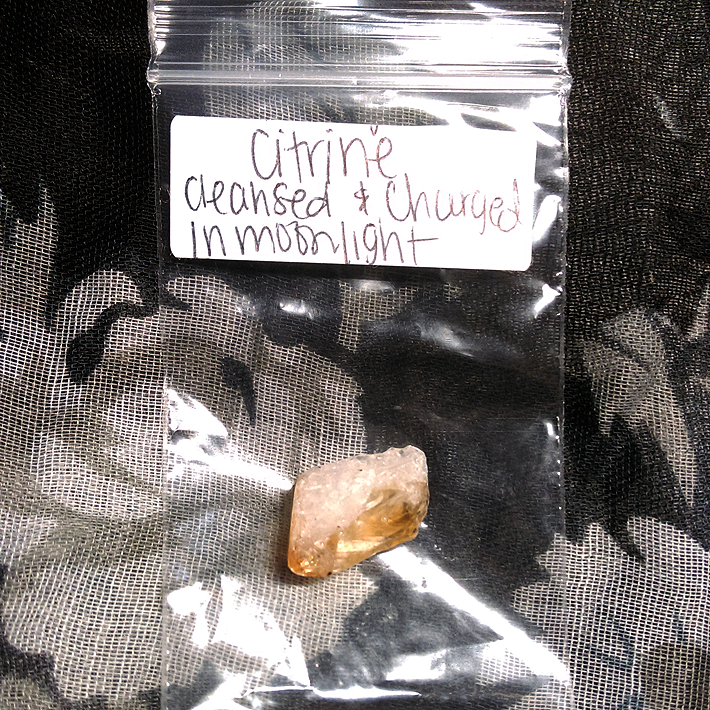 Citrine is a personal favorite. I keep plenty on hand for friends who are struggling with nightmares. Keep it in a pouch over your bed or place it on your bedside table to ward off hypnagogic negativity. Each month, the box includes a special item to fit the theme. Previous boxes have included different aromatherapy and bath items. Last month, appropriate to the Heart Chakra, I received a rose quartz and fluorite necklace that rested directly over my heart. This month’s special item is another piece of jewelry. As much as I love aromatherapy, I’ll get continued use out of jewelry, because I won’t be afraid to run out. This pendant comes from JujuOwls. This is my first ever piece of Larimar and I love it. It has such an interesting texture. I’m excited to wear this wherever I go. 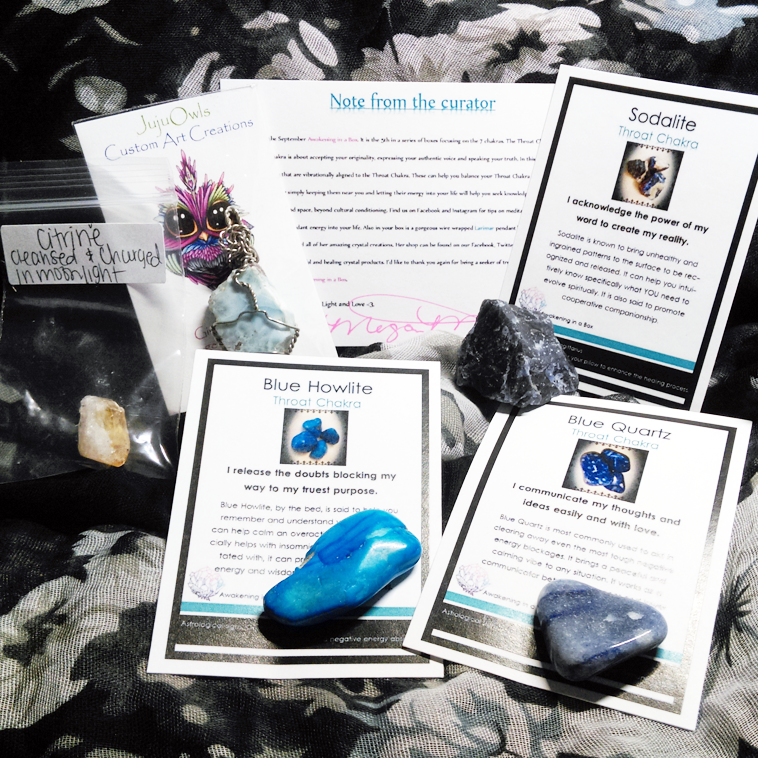 I’ve been very happy with my subscription to Awakening in a Box, and I recommend it to anyone who enjoys gems and minerals. If you’re just starting to get into it, this service will help you get established with a special variety each month. The cards will tell you why you need each of the new stones in your life. Visit the subscription website for all the info. the subscription boxes sound wonderful. I will check them out. I have a CD that has different chants and vocalization tracts corresponding to the Chakra’s .. ( I think at one time I may have given you a copy?).. 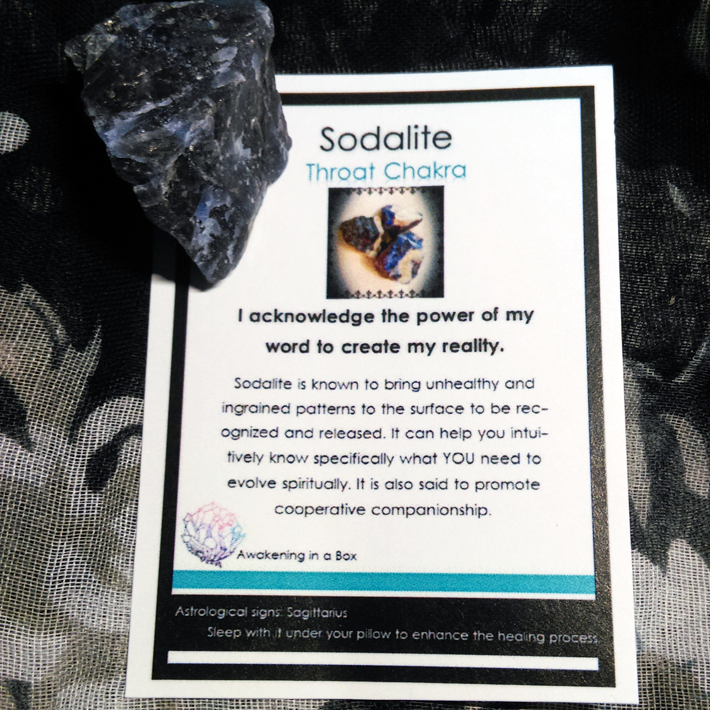 I especially love the Throat Chakra chant. The recorded tracts are quite long so you have time to get into them and really spend some time meditating along with them.